If you already have a PayPal Account, then use your production username/password. You'll have the option of selecting a sandbox/test unstance later. 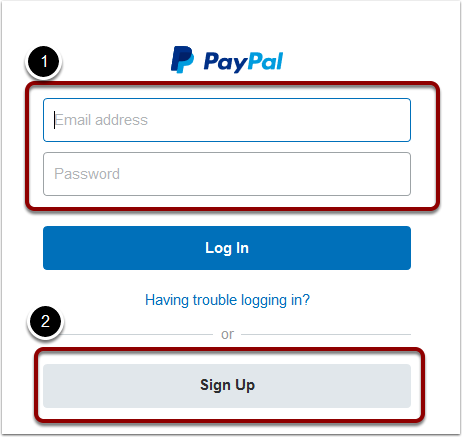 If you do not currently have a PayPal Account, then select the Sign Up option. Please make sure you select a "For Your Business" account type. 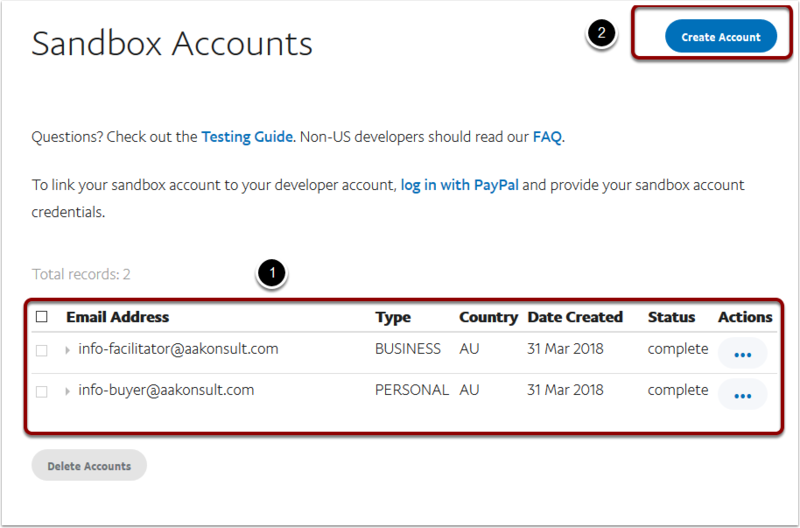 A sandbox instance is useful if you wish to test the PayPal integration. 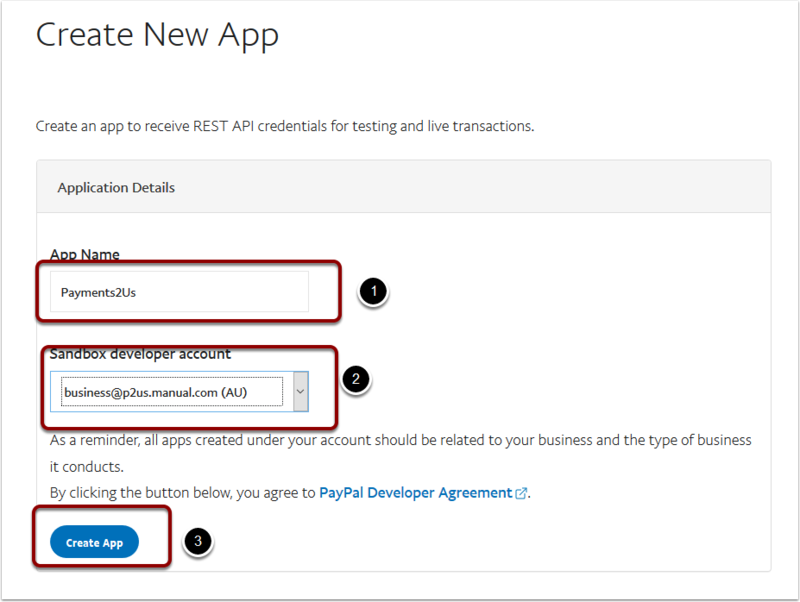 We recommending testing PayPal and your processes prior to setting up a live account. Or, if you'd prefer, you can create your own Sandbox accounts. We would recommend having one account as a BUSINESS Type and one account as a PERSONAL type. The BUSINESS Type is used to emulate your business (i.e. an organisation that is selling and collecting funds). The PERSONAL Type is used to emulate a buyer or person that is purchasing goods from the BUSINESS account. click back to your Dashboard, click on in the My Apps and Credentials. 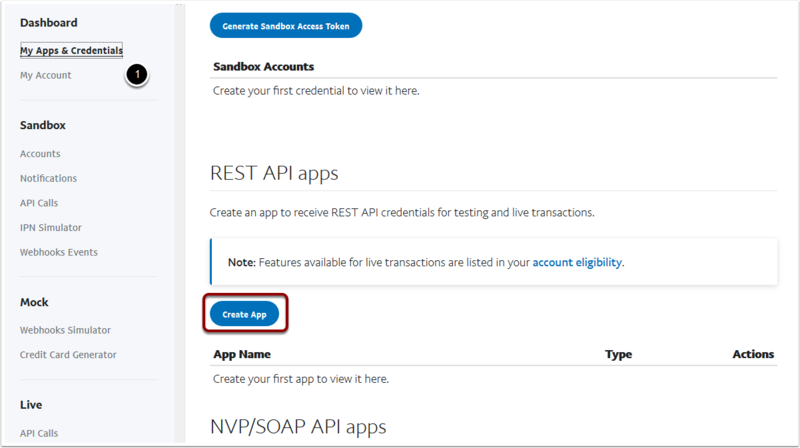 Scroll down toe the REST API apps section and click "Create App"
1.3.1. Name your app, and select your Seller account and then click Create App. Navigate to Dashboard > My Apps & Credentials. Warning, keep these details secure. Do not email these details to anyone. In Salesforce, locate your Merchant Facility that you wish use. 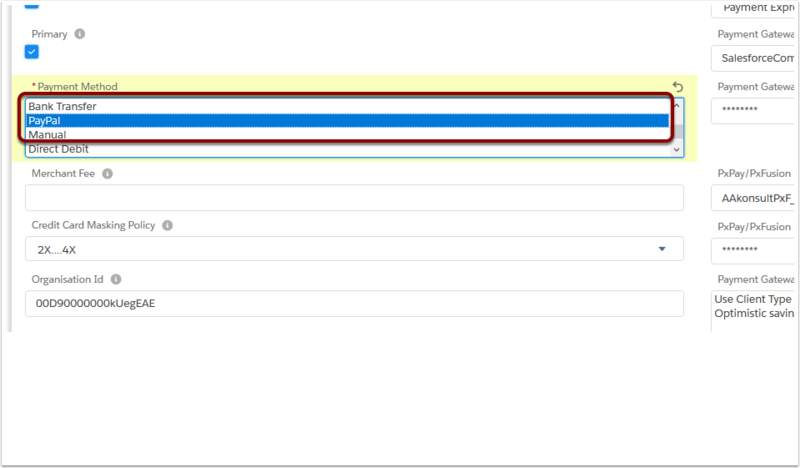 Copy the Client ID code and Secret code. 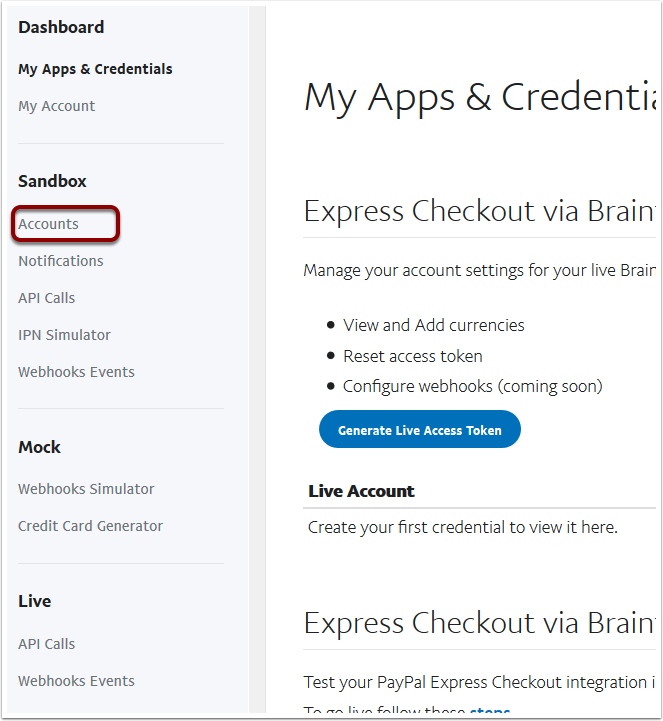 These were located in the previous section of this manual "Locate your PayPal Credentials"
On the Merchant Facility, you can now add "PayPal" as a method of Payment. 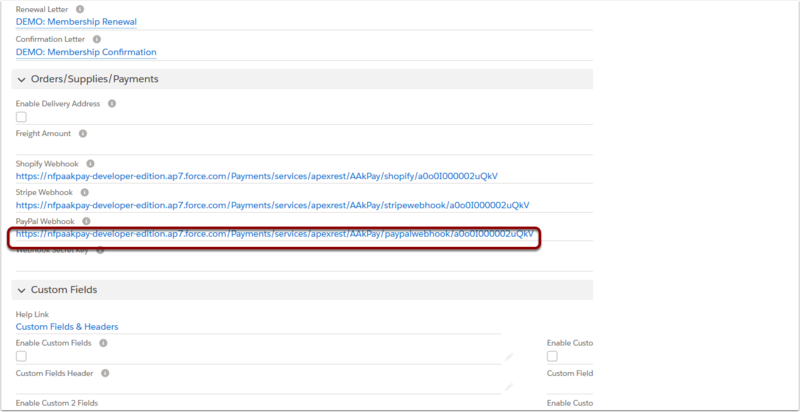 If you don't wish to make PayPal available for all Payments Forms, then you can create a URL Token with PayPal Selected there. Then exclude PayPal as an option on the Merchant Facility. 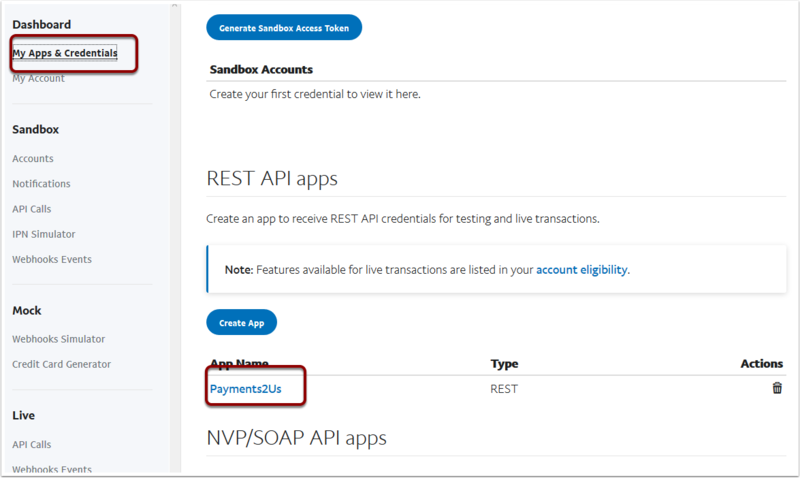 You can configure Payments2Us to work with a PayPal Sandbox (Test) account or Production account. 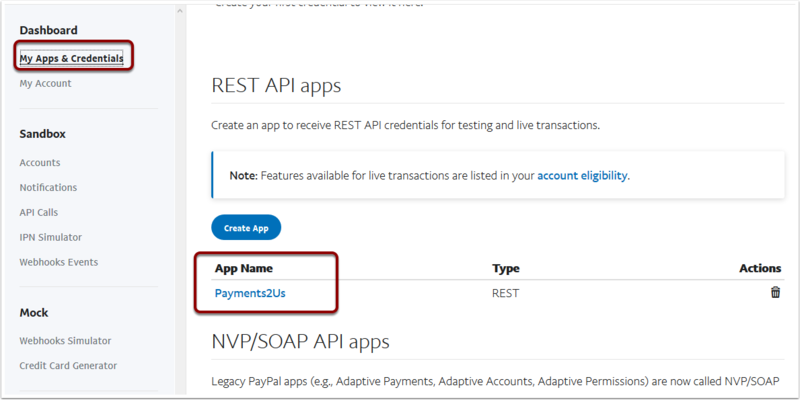 Payments2Us supports PayPal offerings that support the PayPal Express Checkout option. To use recurring payments, you'll need to have a PayPal Recurring License. Please contact info@payments2us.com for a key. 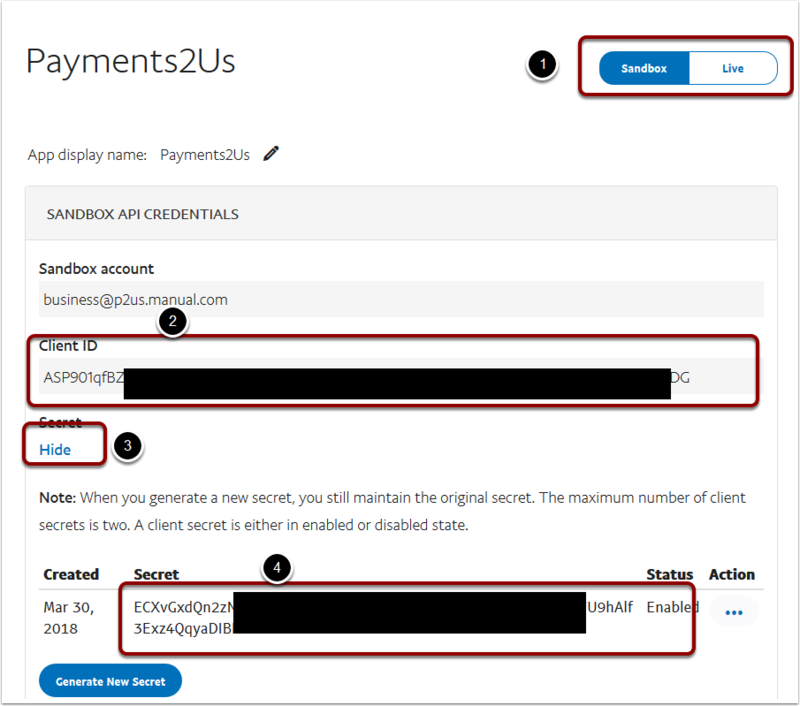 PayPal webhooks are used to communicate PayPal notifications such as a user canceling their service, a successful payment or failed payments. 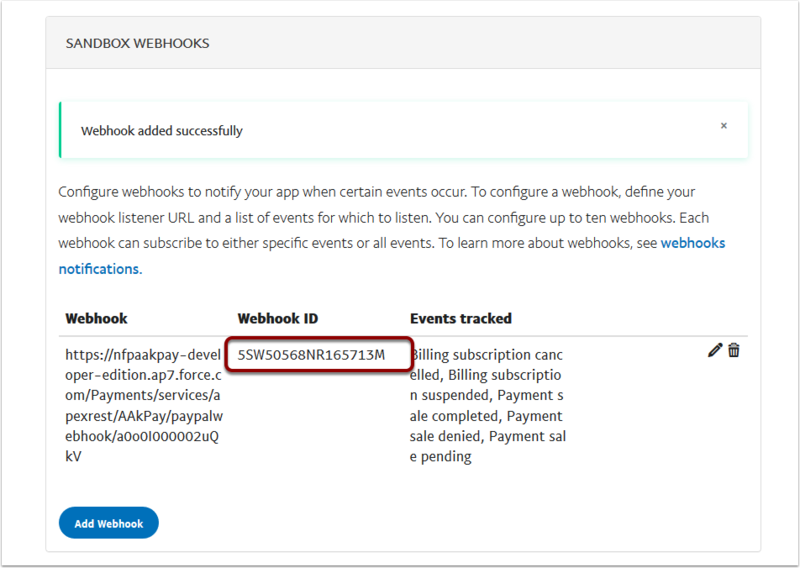 The webhooks will either create a Payment Txn record in Salesforce for payment related activities, or will update the Recurring Payment object status for Billing Agreement related updates. In Salesforce, navigate to the Merchant Facility. Click into the Merchant Facility you wish to use, then locate the Payment Form you wish to use form the related lists. 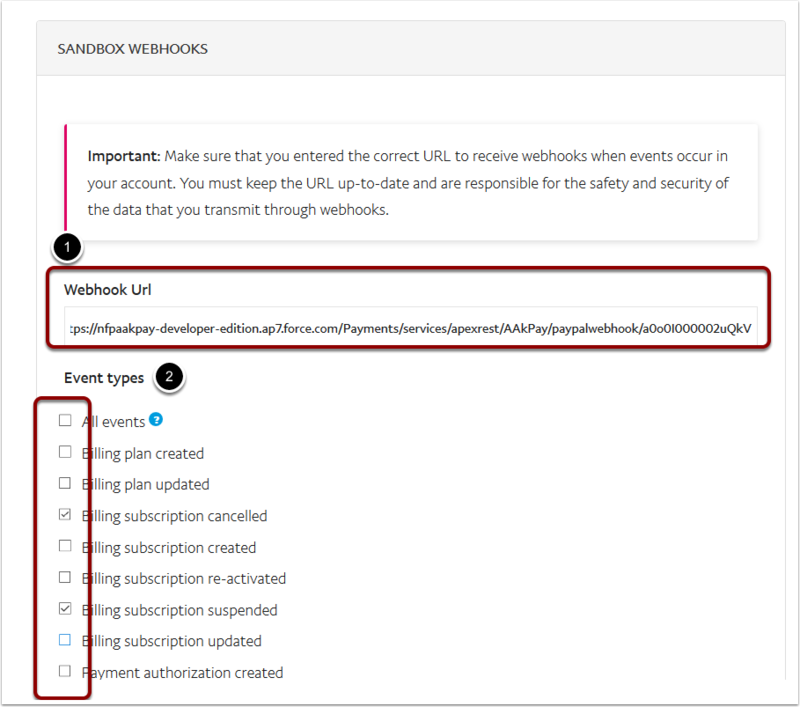 Copy the PayPal Webhook URL. You'll need this for the next step. 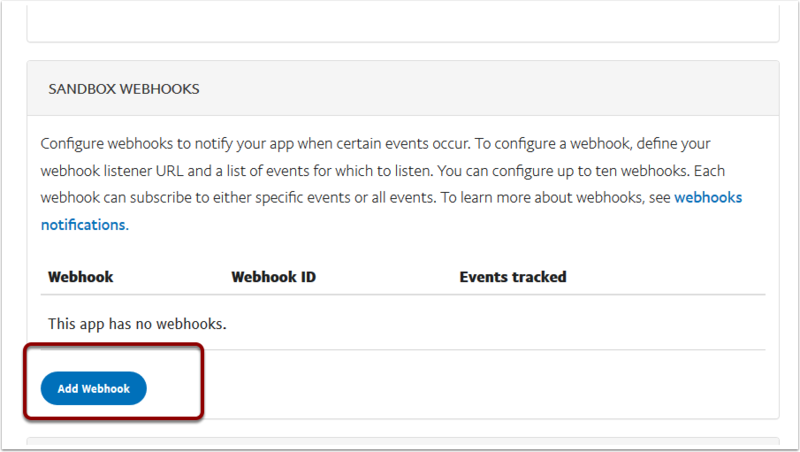 Paste the copied webhook id into the Webhook Secret Key section on the Payment Form. 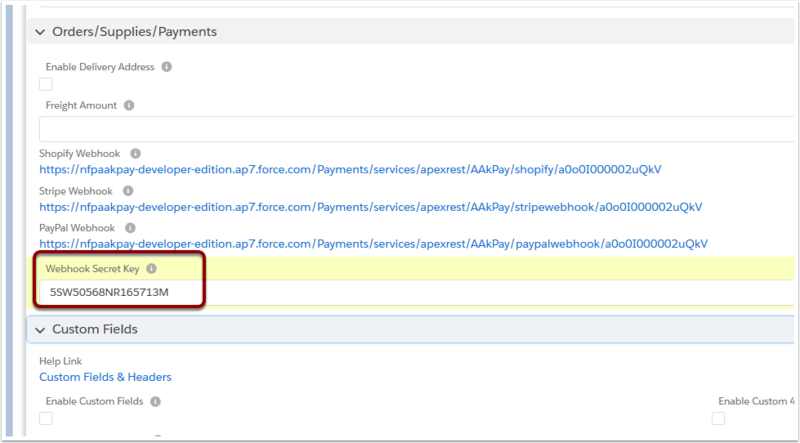 This must be the same Payment Form for where the PayPal Webhook was copied in earlier steps in this procedure.